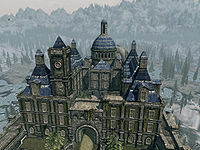 The Blue Palace is the current seat of power for Solitude, Haafingar, and Skyrim; and home to the High King of Skyrim. The palace is split into two zones, the Blue Palace, and the Pelagius Wing. The Blue Palace is divided into ten rooms, and the Pelagius Wing has three rooms. 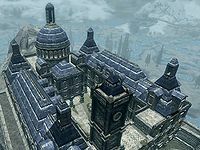 The Blue Palace holds a prominent position over Haafingar. "Been up to the Blue Palace? It's a sight to see." The palace sits on the tip of the arch that Solitude is built on, and commands attention once Castle Dour has been passed. It is the last port of call in Solitude, as the walls of the palace are a part of the walls of Solitude, which themselves are built on the edge of the arch. To explore the full extent of the palace, and to retrieve one of the hidden treasures, you must complete The Mind of Madness. * These people will only appear if their respective cities are taken by the Stormcloaks. Scoundrel's Folly: Squeeze a reluctant informer for information. Delivery: Deliver a bottle of Rum to Falk Firebeard. Elisif's Tribute: Take Torygg's war horn to the Shrine of Talos. Fit for a Jarl: Model some clothes for Elisif the Fair. Kill the Vampire: Do menial work for Sybille Stentor by assaulting a vampire lair. The Palace's entrance is guarded day and night by a Solitude Guard. He stands watching the courtyard, and his gaze cannot be evaded when entering it. It is divided into quarters by cobbled paths, and there are covered paths to both sides of the courtyard. There are six thistle branches here, one in each of the left-hand quarters, and two in each of the right-hand quarters. There is a single door here, past the guard and to the left, which leads to the Palace interior. Everything in the palace is originally marked as owned and taking it is considered stealing. The door opens to a waiting room. During the day Melaran, a mage who works for Erikur, can be found here, waiting patiently for his employer to finish his days work at court. There are two guards stationed inside the entrance, one in the waiting room, and another beyond the arch and in the next room, between two sweeping flights of stairs that lead up to where Elisif holds court daily. There are two chairs, a bench, a table, and a small cupboard to the left, and a small cupboard, a bench, and two tables to the right. There are some standard fine crockery items on the tables, and a copy of the book, The Real Barenziah, v3. On the two low tables there is an assortment of food items, including bread and cheese, and apples. On the higher table there are a few ingredients; namely a chaurus egg, a sample of hagraven feathers, two hagraven claws and a stone bowl containing some more; a sprig of snowberries, a garlic bulb, a purple and a blue mountain flower and a bunch of lavender, with a second bunch of lavender in a tall vase behind. There are also three hanging moss growing from the walls around the room. Beyond this there is a hallway, with the second guards and twin staircases leading up to the Jarl's court. To the right is the door to the Pelagius wing. To the left there is the kitchen, which includes the kitchen and a door through to the staff quarters. Alongside the kitchen is a hallway, which leads to the guest quarters on the left, and a flight of stairs, which lead to the basement which contains additional guest quarters, and more bedrooms upstairs. Up the stairs are Sybille's, Bolgeir's and Elisif's bedrooms, along the (now) right-hand side, in that order, with a guest bedroom between Sybille's and Falk's rooms. The hallway opens to the Jarl's court on the left. 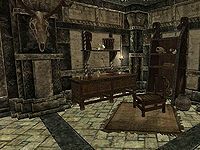 There is a chest containing leveled items beside the door to the Pelagius wing, three deathbell plants in planters, and behind the guard between the staircases, a small garden, containing a snowberry bush, a lavender plant, and two thistles. There is a cupboard, a bench and three tables along the lower hallway. On the right-hand table after the bench, a case of Firebrand Wine will appear during the quest Scoundrel's Folly. There are four benches along the main part of upper hallway and two offshoots from this hallway, leading to Sybille and Elisif's bedrooms respectively. The offshoot to Sybille's room contains a bench, a table, and two sets of shelves, one of which is full of books. The offshoot to Elisif's room contains a cupboard containing clutter, a small wardrobe containing a selection of fine clothes and boots, and a table. 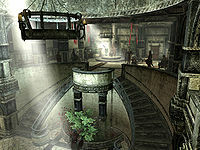 The Jarl's court, the focus of the palace's architecture, is located in the center of the second floor. High up to the left are two windows, they are designed to filter light from outside in such a way that it engulfs the throne. The throne itself is off-centered to the left of the far wall. It is on a double-raised platform designed so that while the jarl is sitting, they are still at the same head-height as the subjects in attendance. There are two tables with a few items of fine crockery and candlesticks by the northeast wall, and to the southeast, there is a table separating a sitting area from the court. There are three chairs, a bench, a table, and a cupboard in this part. To the west is a short hallway, with a cupboard and a bench. The cupboards mostly contain clutter. As you get close to the court for the first time, you will hear the court in session; Varnius Junius is petitioning for troops to be sent to investigate strange occurrences near Wolfskull Cave. Jarl Elisif the Fair occupies the throne, which is located straight ahead and to the left. Sybille Stentor and Falk Firebeard are in attendance to Elisif's left all day. Bolgeir Bearclaw splits his day between standing to Elisif's right, and eating meals on a bench in the hallway behind him. Erikur and Bryling spend their time either standing beside Falk, or sitting on the chairs behind him. Varnius Junius: "I swear to you, unnatural magics are coming from that cave! There are strange noises and lights! We need someone to investigate!" Elisif the Fair: "Then we will immediately send out a legion to scour the cave and secure the town. Haafingar's people will always be safe under my rule." Sybille Stentor: "Your eminence, my scrying has suggested nothing in the area. Dragon Bridge is under imperial control. This is likely superstitious nonsense." Falk Firebeard: "Perhaps a more... tempered reaction... might be called for?" Elisif the Fair: "Oh. Yes, of course you are right. Falk, tell Captain Aldis I said to assign a few extra soldiers to Dragon Bridge." Varnius Junius: "Thank you, Jarl Elisif. But about the cave..."
Falk Firebeard: "I will have someone take care of the cave as well Varnius, you can rest easy. You're dismissed." 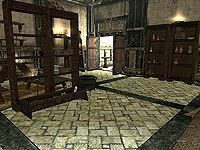 Outside Sybille's bedroom there is a bookcase holding a further eight common books, a small unit holding the usual assortment of fine crockery and at the end of the corridor is a low table with a copy of Lost Legends on top. Falk's room is the second room along the hallway from the court, and it is extended right out to the corridor, unlike the others. It is fairly spartan compared to the other members of the court. 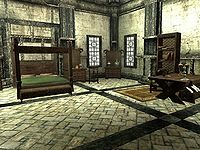 The room contains an owned single bed with an open crate at the foot of the bed containing a random dagger and an iron dagger. There are a total of four sets of shelves holding twenty-one common books, a copy of Charwich-Koniinge Letters, v1 and a potion of minor magicka. 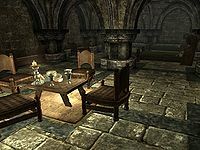 There are also a low table and chair, with bread and cheese on the table, a wooden bench, a small wardrobe holding fine clothes, and an expert-locked display case containing a leveled dagger and leveled greatsword. Two wall shelves above the bed hold a steel sword and a giants club, that you cannot interact with. Bolgeir's room is the third room along the hallway from the court. In comparison to the other bedrooms, it is both compact and full. There is one wardrobe containing the usual assortment of fine clothes and with a common book on top, two wall shelves, Two tables, a desk, a chair, and an owned single bed. 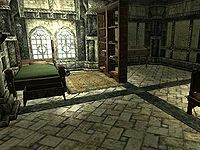 Despite having his own room and bed, Bolgeir prefers to sleep downstairs in the guest quarters, because the bed there is closer to him at all times (of the ones that he is allowed to sleep in). On the table to the right of the door is a bowl with three pieces of bread, and a sliced eider cheese on a plate. On the desk are three potions; a potion of strength, a draught of health, and a potion of regeneration, a bunch of tundra cotton, and a copy of Wabbajack as one of three common books. There is a bunch of tundra cotton and drum on the wall shelf above. The other wall shelf has two rolls of paper on it and is above the table to the right of the door. There is a set of shelves beside the chair. On these you will find an iron helmet and shield, a common book, a copy of Short History of Morrowind, a candlestick and another bunch of tundra cotton. There is a final bunch of tundra cotton on the table by the window and a set of shelves to the right holds eight more books and a flute. The corridor leading to Elisif's room has a cupboard containing clutter, a small wardrobe containing fine clothes and an empty table along it. It is the last room along the hallway from the court. The room is rather spacious, and focused nominally on the owned four posted double bed. There are five small and two tall wardrobes around the room, all of which contain a selection of fine clothes and boots, an end table containing clutter, a long chest containing random items, five tables, and two chairs. There are only two things of real interest in the room, an unusual gem beside the bed, and a copy of the Speech skill book Biography of the Wolf Queen, on one of the small wardrobes, in a sectioned off part of the room opposite the bed. Two of the tables beside each other have a selection of bread and cheese, two baked potatoes, a sweet roll and red and green apples on them. A third table has a bowl containing a purple and a blue mountain flower. The largest table is the one she seems to sit at, it has a drum, a bunch of tundra cotton, a potion of health, a candlestick and a quill and ink pot on top, and an open crate containing three rolls of paper, a potion of minor stamina and a bunch of lavender underneath. Beside this table is a set of shelves holding nine common books and a flute. beside the small wardrobe beside the bed is a basket with a small coin purse hidden inside. There is also a small coin purse on top of the wardrobe by the door, two wash basins around the room and a large vase holding a bunch of tundra cotton. The kitchen is Odar's realm. He runs the kitchen with the general help of the two servant girls, Erdi and Una. Unsurprisingly there is a vast amount of food around the room, but no barrels or sacks of the same found in the kitchen. There are three dining tables with four baked potatoes, a sweet roll, six salmon steaks, several pieces of cheese and two bottles of alto wine on top. A table used for food preparation has three fillets of salmon meat, two potatoes, a carrot, a leek, three tomatoes, two bulbs of garlic and a sheaf of wheat on top and there is a narrow table with a bowl of bread, a plate of cheese and an iron dagger against the southwest wall. There is a bottle of spiced wine on the small unit, with another bottle in an open crate that both become marked as unowned once you have completed Tending the Flames, even if nothing else in the kitchen may be taken. A total of eight wall shelves around the room holding; two haunches of horse meat, a rack of dog meat, a haunch of raw venison, a bunch of lavender, a baked potato, a potato, many more pieces of bread and cheese as well as many items of clutter. There are four bunches of dried elves ears, a garlic braid, a bunch of dried frost mirriam, two rabbits, a pheasant, and two whole salmon hanging from racks around the room and two sets of shelves in the northern corner holding a leg of goat, a rack of dog meat, a seared slaughterfish steak, a fillet of salmon meat, a slaughterfish egg, a rock warbler egg, a salmon steak, a gourd, a potato, five bulbs of garlic and plenty of bread and cheese on the shelves. There is an oven shelf in the northeast wall with another baked potato and portion of grilled leeks next to an empty metal pot. To the right of this is an unusable woodcutters block with a woodcutter's axe on top. In the western corner is a door which leads to the staff quarters. 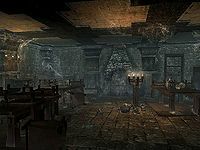 The staff quarters are used by Una, Erdi, and Odar for sleeping, and are also partially used as a storeroom. There are a few baskets with some brooms along the corridor leading to the main chamber. Opposite the entrance is a small storage area with two barrels, two mead barrels, and a set of shelves with eighteen empty wine bottles. The main chamber has four beds, one in each corner, with two wardrobes between each them back-to-back. There is a table with a bench, and the room is well lit by numerous candles. There is hardly anything of value here, except for one thing; a potion of regeneration on the shelves above the table. The beds here become available for sleeping after completing The Man Who Cried Wolf. The room is located along the hallway from the kitchen. It contains two double-beds, four wardrobes containing a selection of fine clothes and boots, three tables, and three chairs. The room is bare besides the furniture, containing only a bowl, a pot, and a bunch of tundra cotton, all on the table in the far right-hand corner of the room. The basement is located at the bottom of the stairs, which themselves are at the end of both the upper and lower hallways. The basement is actually designed as more guest quarters, containing three beds, a table surrounded by four chairs, and six benches around the edges of the room. The table holds two pieces of bread, sliced eider cheese, and some fine crockery. 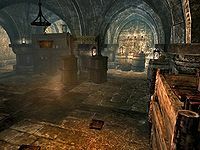 If the Stormcloaks gain any holds during the civil war, the displaced jarls will relocate to the basement of the Blue Palace. The Pelagius Wing, named for Pelagius the Mad, is locked. You will need the key, and Pelagius' hip bone, to open the door, and it is only available from either Erdi or Una when the quest The Mind of Madness has started. Despite assertions from Falk that the wing has been "sealed for hundreds of years", the servants reveal that they enter once a year to get rid of any spiders. The wing is in a decrepit state, with chairs upturned, fine crockery on the floor, and cobwebs everywhere. It certainly lives up to Erdi's claim that "...it's scary in there! "', and the possibility of the ghost that Una claims is there is not that far-fetched either. There are three tables with their chairs placed on top of them in the first room. 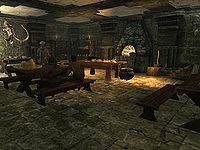 There are at least twelve bottles of alto wine, seven bottles of Nord mead and nine bottles of wine in the first two rooms before the hidden portal upstairs, they are on the crates, the floor, on tables and barrels and even on the oven shelf opposite the entrance. The doorway to the right is boarded up. The door on the other side is not, and it leads upstairs. Under the stairs and in the first room are several barrels of food, while beside the stairs is a set of shelves with a pair of iron boots on the bottom shelf and growing from the ceiling at the top of the stairwell above is a hanging moss. The room upstairs is laid out as a bar. There are four bar stools placed on the counter, and four tables with their chairs placed on them. There is a hidden portal to The Mind of a Madman in the hallway, which cannot be avoided if you wish to access the rest of the wing. Once you return from The Mind of a Madman, you can follow the hallway which have three hanging moss growing from the walls to another stairwell with another hang moss growing down the wall, which lead down past the boarded-up doorway to a basement. The basement shows signs of being lived in, with a bedroll in the far corner with lit lantern and a copy of Thief of Virtue beside it. There is also an iron sword on the lip on the bottom of the west wall near the bed roll. Before that though there are some crates with a chain mechanism set on it, and on the crate to the left, there is a copy of the Lockpicking skill book Surfeit of Thieves. Between the bed and skill book are four sets of shelves sitting back-to-back, and filled with mead and wine. There are in total nine bottles of alto wine, nine bottles of Nord mead and seven bottles of wine in the basement area. There is a single potato in a metal pot hanging from the ceiling near the skill book and a leather strip on one of the many food barrels around the room. By the entrance there are a few boxes holding approximately fifty burned books. The Blue Palace is mentioned in the books Walking the World, Vol XI, and volumes v3 and v6 of The Wolf Queen series of books. Walking the World also claims that the Pelagius wing "has been locked and left alone since shortly after Pelagius's death." which is proven untrue by the statements of the servants. Elisif keeps her position as Jarl if the Stormcloaks win the civil war. 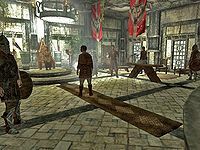 Any Jarls removed from their positions in Imperial held holds move to the basement of the palace. 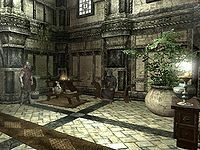 If you are in Solitude, and above level 4, the guards may suggest that you head to the palace, although they aren't complimentary about the people there, "Been up to the Blue Palace? It's a sight to see. Even if it is filled with fops..."
The Pelagius Wing was named after Pelagius the Mad. Once you have completed The Man Who Cried Wolf most of the low value items and ingredients are free to take, with the exception of the bunch of lavender found in the large vase within the waiting room. Except for most barrels and sacks, all containers in the location are non-respawning and safe to store items in if you wish to. Interestingly, Elisif's throne is marked in the Creation Kit as belonging to Ulfric Stormcloak. The activators for the doors to both Elisif's and Sybille's bedrooms are not fully connected to the doors themselves. There is an invisible barrier in the middle of the doors that can be walked around on either side. If you close the doors after entering the rooms, you can walk through the doors, but will be totally blocked from exiting the rooms by an invisible barrier, which is about a foot away from the doors, until the doors are opened. The bug doesn't appear until the doors have been closed for the first time. This page was last modified on 10 October 2018, at 20:22.